Lessons from the first year of ShopHouse, the "Asian Chipotle"
The fast-casual industry buzz is all about how the “Chipotle effect” has propelled this segment into super growth mode. But few have felt the effect as keenly as Chipotle’s own culinary manager Nate Appleman and director of concept development Tim Wildin. Last year their brainchild, ShopHouse Southeast Asian Kitchen, opened in Washington D.C.’s Dupont Circle, with the goal of doing to Asian street food what Chipotle did to burritos. Despite the blessing and guidance of Chipotle founder Steve Ells and the operational support of the home office, Appleman and Wildin ran ShopHouse like an independent, fine-tuning recipes, décor and training as they went along. Now, a year into the experiment, ShopHouse is set to open two new locations, one in D.C.’s Georgetown neighborhood and another in Santa Monica, California. And after a year of avoiding the media curiosity the “Asian Chipotle” inevitably generated, Appleman and Wildin sat down to discuss the lessons they’ve learned. RB: Looking back, what were some of the biggest surprises? Tim: We were pretty surprised at how well the final dishes were received. This is pretty funky food for a QSR. And it’s not especially quick [to prepare ahead of time]. Some dishes use 20 or more ingredients to create the right salty-sweet-sour balance characteristic of Southeast Asian street food. It’s not a turnkey kind of cuisine. I was shocked how most of our crew was so unfamiliar with Thai and Southeast Asian cuisine. In our world, this food is so familiar. But we trained them to love it and now they can talk really well to customers about every ingredient on the line. It’s totally familiar and they have a sense of pride and ownership in the menu. And the format is friendly—it breaks down a Southeast Asian meal into components. RB: How did you train them to love the food? Nate: Part of learning the menu, a complex menu, we had them eat the food. They all enjoyed it. That made the training easy. Tim: We don’t do family meals. Every day before we open we have our own style of family meal: they go through the line just like a customer and eat the food every day. Nate: We treated this like a brand new restaurant, not part of a big corporation like Chipotle. We treated it like an independent. We empowered managers to create that training system. You start by learning the food. Eating it. Cooking it. When we say training everyday, we mean real training on the job… It is a concise and focused menu. The scope of learning is not huge. That allows them to quickly become experts. Tim: We also stressed to our management team that we were not necessarily looking to hire people with restaurant experience. We were looking for that something that lets them connect with people in a meaningful way. RB: How do you see this changing as you grow to more locations? Tim: We’re never going to be that super-rigid corporate restaurant, that’s not the food, that’s not the restaurant. 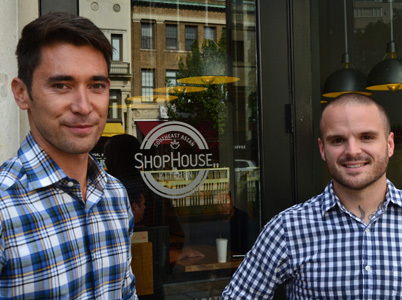 We empowered the management to create what ShopHouse is. Nate: It’s important to keep in mind: these people are cooking every day. When you compare to others in the QSR space, it’s much different. These people are cooking. They have sharp knives and cutting boards. They have a wok that cooks at 1,000°F. RB: Would you share some of the lessons you learned this past year? Tim: Go with menu items that work on both an operational and culinary level. Our Banh Mi sandwiches missed on several core points. The bread had to be purchased from a separate vendor and was a SKU used only for the Banh Mi, plus the sandwiches missed out on the vegetables, curries and sauces that were the focus of the bowls. I wanted to ditch the Banh Mi before we opened, but when we finally did, it was a difficult decision because sales were high. Nate: We had to tone down the spiciness of the food a bit to make it friendlier. Some authentic Southeast Asian flavors are too spicy for Americans. Tim: Yeah, we didn’t want to burn people’s faces off. One of the problems was in the supply chain. We wanted to source Thai red chilies for our recipes, but there was a flood in Thailand and we couldn’t get them. We had to use Taiwanese chilies instead and they were super hot. Nate: We started at a very high level and went with a lot of ingredients. We worked very hard over the last year to get everything right, and the recipes have evolved. So we’re not looking to add anything new but I’m always tinkering. RB: What are you tinkering with right now? Nate: Honing in on cooking techniques and ingredients. Just because we buy great broccoli now doesn’t mean we can’t find better. Tim: So many other companies, fast food companies, are in a race to the bottom. How cheaply can we deliver this to our customer. We’re not interested in playing that game. It keeps us on our toes. Finding even better green papaya, better chicken and keeping it at a price point that’s acceptable to our guests. RB: How is the brand evolving? Tim: We opened the first ShopHouse with very limited resources. We spent a lot of time training the crew and they became very good at engaging with customers. The best marketing you can do is within your four walls. The brand is tangible—it’s the experience customers have in our restaurant. Refinements will be made over the next year as we expand. We were able to be very nimble with one location, but it gets more complicated with two or three. We’ll also have more resources available to us. RB: What is the marketing you do within your four walls? Tim: It’s completely antithetical to what people would think. No posters, no advertisements. Just good, simple design. An open kitchen. It’s the spread of food that you see. That’s the marketing. RB: Are you surprised that other brands are copying ShopHouse? For example, PF Chang’s Pei Wei Kitchen is similar. Tim: It’s no surprise. Chipotle is what many QSRs want to be, and Chipotle owns ShopHouse, so other concepts are wanting to copy it. Nate: They may be trying to copy us but without an eye toward design and productivity, or flavor. What sets ShopHouse apart is that we start with expensive ingredients and create a great meal for $7. RB: Is there anything you would have done differently? Nate: Not really. Everything we did was a learning experience and helped us get where we are today. Tim: It’s all about people executing our vision. Every day is a training day and every day is a learning day.